It seems lately everyone is trying to classify disputes. Well, never let it be said that I wasn't one for jumping on the bandwagon. Resolving Disputes can be as simple as . . . keeping it simple! A common key to resolving conflicts is to find the initial trigger. As a culture, we really like there to be a bad guy, a reason why things went south, a scapegoat, someone who started it, leaving us feeling pretty clear and blameless and dang good about ourselves. But what if . . . shudder to even say it . . . we are all a little good and even (deep breath) a little bad? An impediment to reframing–or any worthwhile communication–is showstoppers. Showstoppers are words that have inflated the conflict so much that it feels immovable. We all go to conferences and we talk about our natural abilities as mediators, but the reality is we don’t have Chef Ramsey or Father Herzog telling us where we glaringly need to improve. In the mediation room, we don’t even have each other to point out areas of improvement. When it comes down to is, we only have our clients. Resourceful Internet Solutions, Inc. (RIS), the world's leading online technology provider for the ADR industry, with flagship websites at Mediate.com & Arbitrate.com, now offers three ODR websites, plus Caseload Manager technology, all dedicated to helping ADR programs and practitioners extend their dispute resolution work online. This article discusses how participants bring up the past in mediations, as though it would have some bearing on current mediations. People act so differently in conflict situations that their past actions rarely affect their mindset in a mediation. When we listen we absorb a bit of each story. And as I have walked around these past few days, at the grocery store, the post office, etc. people have changed. They have sobered a bit. They might not laugh as much this week, but they hold their loved ones much tighter. We are lucky as mediators to work in a field where supporting others in the field also serves to benefit the individual. In this win/win environment, let's take a moment to celebrate each other's successes. As mediators, we have long known the importance of creating the proper setting for a mediation. Where do we place the chairs, do we provide water and coffee, do we cross our arms or lean back into our chair. In a recent Fairly Legal episode, I watched Kate Reed on her “mediation high.” Her face was flushed, her words had accelerated. it was apparent her heart rate had quickened. In the midst of the conflict, the tension, and the anxiety she almost looked like she was . . . enjoying herself? One thing that I have noticed from watching Fairly Legal is that Kate Reed is so effective at her job, not just because the skills come naturally to her, but also because she is very comfortable with the process. She doesn't have to waste time thinking about when to consult an expert, what constitutes as legal advice, what is a break of confidentiality, what is an enforceable agreement, and what are the parties real interests. This shows me that she has years of training and practice which, combined with her natural skills, have created a very effective (albeit slightly wacky) mediator. Judges and court-appointed mediators have an interesting relationship. ”Interesting” can be defined as big brother, incestuous, or a match made in heaven. "Neither snow nor rain nor heat nor gloom of night stays these couriers from the swift completion of their appointed rounds." -- Appropriate for a mediator's motto? Managing a complex caseload? This article shows you how to manage your caseload with innovative technology, online organizational skills, and developments in online security. Is it our job as mediators to win-win at all costs? Or is it our job instead to let the clients decide for themselves what is a win, even if it is not the win we want? Fairly Legal is currently advertising the renewal of its second season. Meaning there are photoshopped pictures of Kate Reed appearing everywhere. It also means that mediators across the county are united in a common conversation. The Goal is to be Fair, right? Or at last make sure the parties feel that the process was fair. My upbringing, my training, and my default is to see everything in tie-dye. But sometimes when I define things in black and white, my clients find peace with flying colors. Some people see things in black and white; I see them in tie-dye. This is one of my favorite quotes from my father. Sometimes life is simple, it’s black and white, it’s win/lose. And then you walk out of the movie theater and back to real life. When I first began mediating, my mentor told me that a good mediator can mediate any type of case. The important thing was not familiarity with the subject of the mediation, but familiarity with the process of mediation itself. Is this true? Our jobs as mediators is never to tell people the answer. That is the job of someone who has a long black robe and a gavel. Our job is to figure out what the pieces are and help the parties to line them up properly, and then once everything is clear let the parties finish it. Kate is an evaluative mediator. Evaluative squared. An evaluative mediator gets her power from providing opinions and suggestions on the case. Some clients find these suggestions helpful, some find them to be unwelcome. Some mediators see evaluative mediation as offering wisdom, some see it as the antithesis of mediation. You know those mediations where the clients walk into the room and say, “I was totally pig-headed. I don’t know how I could have been so rude.” Or do you know those clients who say they have been hard to work with and are ready to make things right? Yeah, me neither. I was just visiting the Fairly Legal website. I saw a game where you submit your problem and Kate Reed will answer it for you. Scoffing at what a mockery she is making of our profession, crying at what a travesty this was that she can minimize my job into an online game, I did what anyone else would do in my situation: I submitted a question. And, dangitall, she had a good response: confront the other person directly, humbly, tell them how it made you feel, and see if you can work out a solution. You’ve gone too far, Kate! In the first episode Kate prevents a robbery in a convenience store. In the second episode Kate prevents a fight between a taxi driver and a bicyclist. 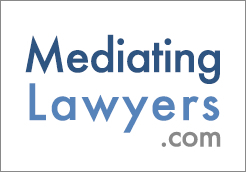 First–if you’re a mediator–you know that most people think the mediation profession is a misspelled form of meditation. Simply put: the average TV watcher is just not that familiar with what mediation is. It's common today to hear the perfect person being described as "living in balance." As though we all want to run around being little Stepford robots with every little moment being completely, perfectly planned. That's not me. And I would venture to say, that is not true of most of the mediators I know.